Check out this little monkey! We weren’t sure how Parker would like being dressed up in his first Halloween costume, but he didn’t seem to mind one bit…not even the headpiece or giant feet. He was a good sport for our photo shoot, and will have a couple more opportunities to wear his costume before the week is over: to the Halloween party at baby group on Wednesday, and on the big day Thursday when we take him “trick-or-treating” to some of our friends’ and families’ houses. I’ve never been a fan of Halloween, but I have to admit it’s fun dressing up an adorable baby! We’re pretty convinced that the sleep troubles — as well as the crazy amounts of drool, fussiness, and desire to put EVERYTHING into his mouth — can be attributed to teething. But for the most part, he’s still our happy little guy, full of smiles and giggles. We found out at baby group on Wednesday that Parker is finally up to 13 pounds! 13 pounds, 2 ounces to be exact. I’m not sure about his length since his last checkup, but it seems like he’s grown another 6 inches. This kid is sooooo long. His 3 month pants are starting to look a little short, but he still has a ways to go as far as filling them out. We ended week 19 with a little pre-Halloween photo shoot of Parker in his costume. I wasn’t sure how he’d do wearing it, but he seemed to enjoy “monkeying around” in it. Pics to come! It’s been awhile since I’ve been this excited about a music therapy resource. When Lisa Barnett of Songs to Grow On first contacted me about her new songbook, I was intrigued…but it wasn’t until I received my copy in the mail that I realized just how useful it would be in my practice. My House is an interactive songbook designed for children with autism which lets them share their stories about where they live, who they live with and the special things and people that are important in their lives. 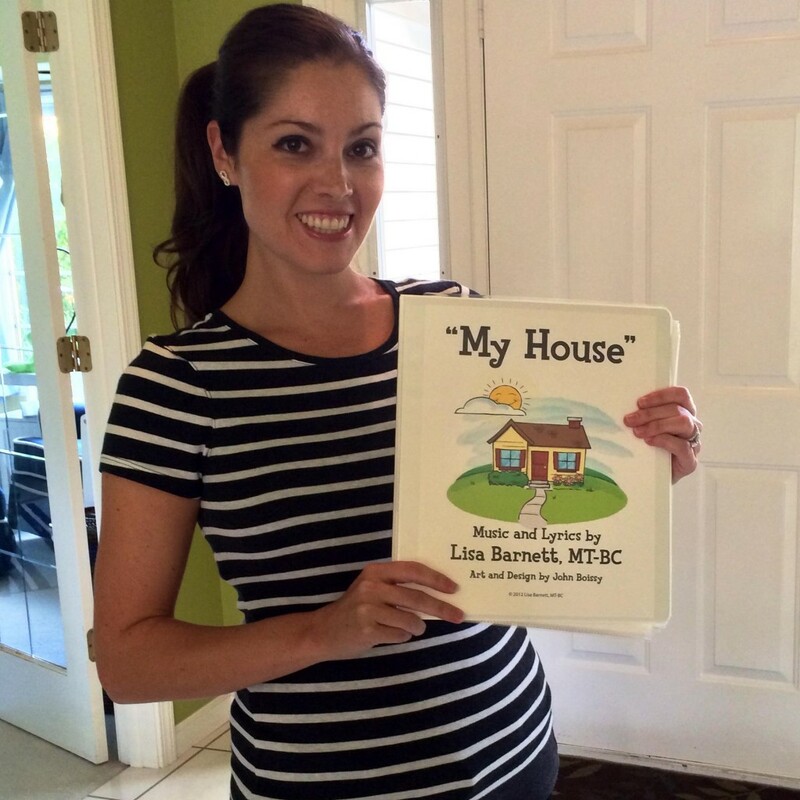 The book has spaces on each page to add a photo and corresponding label, giving children and their families the creative license to choose which elements of “their house” will be featured. I didn’t waste any time putting the songbook to use, and I had just the student in mind to try it out with for the first time. Knowing that I have a super busy schedule between taking care of my baby and working full time, Lisa generously sent me an already assembled version of the book — all I had to do was add photos provided by my student’s family. My student, her mom and I had so much fun singing about “her house” for the first time last week! Each page allowed an opportunity for her to name the person/room/item in the photo, and then find the word to match. After we labeled each photo with the correct word, we went back through and sang the song together. The song itself, which Lisa wrote and recorded professionally, is singable and super catchy — my client was still singing it after we were finished. You can listen to it here. Again, I have to tell you just how impressed I am with this new resource. The book is beautifully designed in a sturdy binder, the pages are in protective plastic sleeves, and the word menu comes laminated with plenty of velcro to attach word labels. My students have a tendency to be hard on my materials, but I don’t have to worry about them damaging this one! I’ll be writing more about my experiences with using My House in my music therapy sessions, but I wanted to share it with you right away so that you can check it out for yourselves.